The thought experiment here is to consider a universe that contains a black hole with a mass equivalent to the amount of dark energy, a seemingly incomprehensible 2.4 E 54 kg. Such a massive feature would cause space to curve on a scale that is hard to truly appreciate. It's event horizon, for one thing, would be at a radius of 376 bly from the singularity. Can a model of the universe based on this scenario be concocted? Not in a Flat homogeneous universe. Consider a finite universe represented by a spherical 2-D model, (i.e. the entire universe, both the observable portion and the space beyond, is represented by the surface (not the interior) of the sphere). For reference purpose the 2.4 E 54 kg Black Hole, which would be located somewhere on this surface, we will position at the model's south pole. 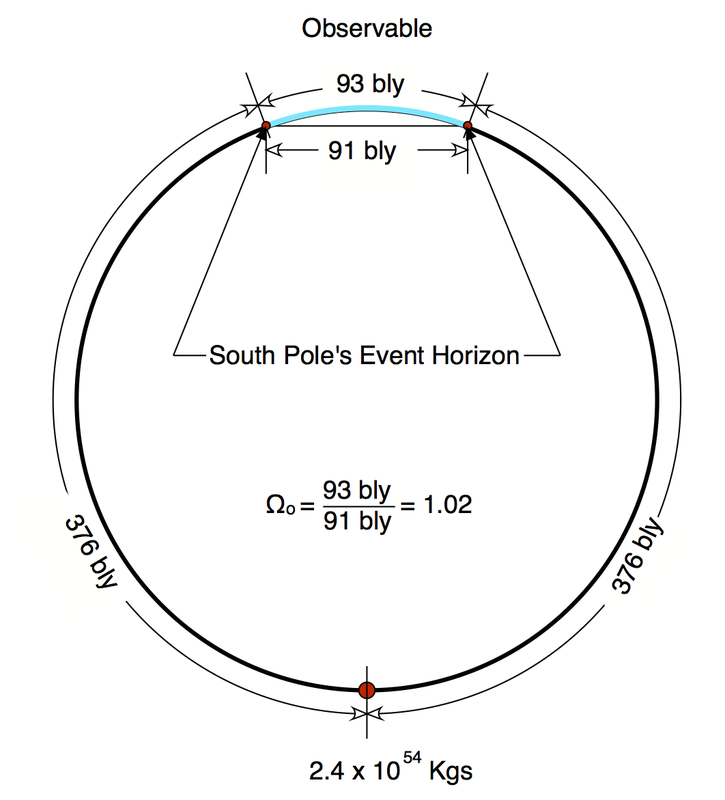 Let's now assume that the space that lies beyond the massive south pole singularity's event horizon, is the same size as our observable universe, approximately 93 bly in diameter. This space outside the event horizon would be centred on the north pole. Looking at the overall geometry, specifically the curvature ratio of the arc of 93 bly to the complimentary chord subtending the arc of 91 bly yields a curvature parameter of 1.02 which is the generally accepted value for the universe's curvature parameter Ωo, +/- .02.